Tinnitus can affect daily life in multiple domains. People with bothersome tinnitus report impaired sleep, interference with concentration, decreased social enjoyment, and difficulty hearing conversational speech. In cross-sectional studies, tinnitus has been associated with increased odds of anxiety disorder and depressive symptoms. Read the latest NEJM Clinical Practice here. A: Population surveys estimate a prevalence of tinnitus of 10 to 25% among persons older than 18 years of age across various nationalities. In population surveys, the sensation is reported to be severely bothersome in only a small percentage of persons with tinnitus (range, 1 to 7%). The prevalence of persistent tinnitus increases with age, reaching a peak among persons in the seventh decade of life, but the prevalence has increased among younger age groups over the past decade, presumably because of increased exposure to damaging recreational noise. Q: Does tinnitus ever resolve spontaneously? A: The loudness, severity, and effect of tinnitus are dynamic and change over time. Tinnitus can progress in severity in some persons, but it can decrease in severity and even resolve in other persons. For example, in one longitudinal study, approximately 40% of persons who had reported mild tinnitus and almost 20% who had reported severe tinnitus at baseline reported resolution at 5 years. An important component of management includes educating patients about the causes of tinnitus and the natural history of the condition, including possible spontaneous reduction in severity with time. Q: Are there effective medications for the treatment of tinnitus? A: A wide range of drug classes have been tested in the treatment of tinnitus, including antidepressants, anxiolytics, antiepileptics, and anesthetics. Large systematic reviews have concluded that the strength of the evidence to support these agents is low. For example, a Cochrane review of the use of antidepressants for the treatment of tinnitus identified only six trials that had sufficient quality for study, of which five were rated as “low quality,” and concluded that there was no evidence of efficacy of antidepressant drug therapy in the management of tinnitus. Whereas some studies have reported a reduction in subjective tinnitus loudness and an improvement in tinnitus-specific quality-of-life outcomes, these modest improvements are likely to reflect the modulation of depression and anxiety rather than direct effects on tinnitus. Current clinical practice guidelines do not recommend medication for management of the condition. Nonprescription treatments such as herbal extracts, dietary supplements, and vitamins are commonly advertised as tinnitus cures, although they have no proven efficacy. Ginkgo biloba is the most commonly used supplement, and a systematic review of trials likewise did not show evidence of benefit in the alleviation of tinnitus. 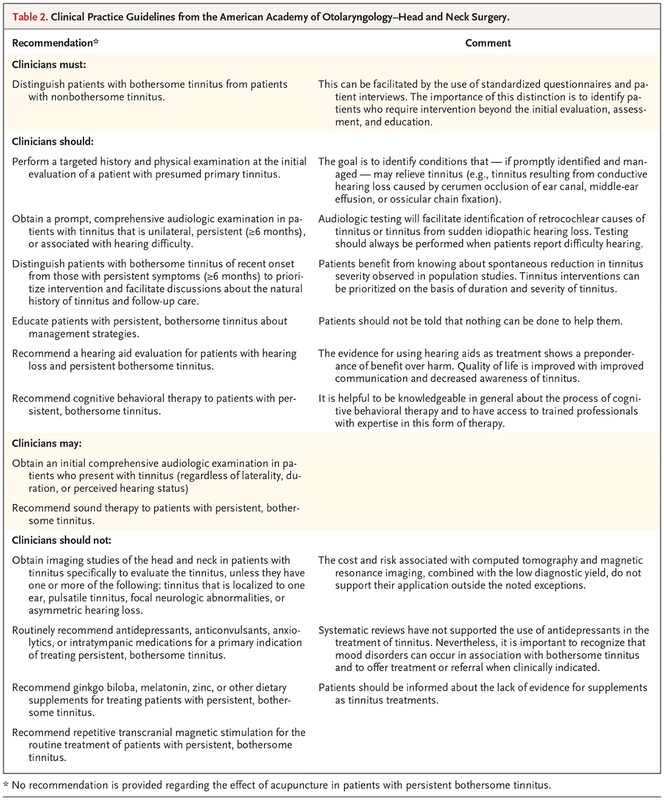 Q: What nonpharmacologic approaches presently exist for the management of tinnitus? A: Cognitive behavioral therapy is currently the most common psychological approach used and studied worldwide for the management of tinnitus. Cognitive behavioral therapy is a collaborative therapy that includes attention-refocusing techniques, relaxation training, mindfulness training, cognitive restructuring, and behavioral modification to change a person’s reaction to tinnitus. A hearing aid evaluation can be recommended for patients with hearing loss and persistent bothersome tinnitus. The evidence for using hearing aids as treatment shows a preponderance of benefit over harm. Quality of life is improved with improved communication and decreased awareness of tinnitus.